Bringing authentic Romana Pizza to Brighton Seafront. 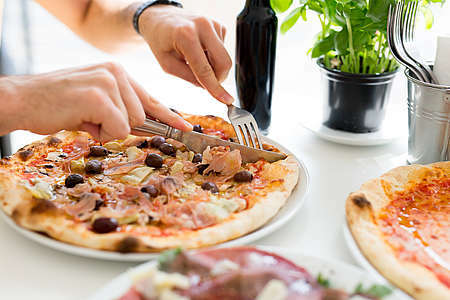 Located opposite Brighton's West Pier and just past the British Airways i360 on Kings Road, The West Pier Pizzeria offers fresh Italian dining with an unforgettable view of the Sussex coastline. The majority of pizzas you eat are in the "Neapolitan" style: thin and chewy with bubbled dough. But some 120 miles north of Naples, another style of pizza dominates - Pizza Romana. Pizza Romana is made using a completely different technique, resulting in a very different-looking and tasting pizza. It's thinner, crispier and has a smaller crust - our dough is double fermented following our own preferred method. Take a look at our Menu with all the options you will find in our Pizzeria or visit our own website. Come and taste authentic Romana Pizza at West Pier Pizzeria - you won't be disappointed! All guests staying in the Hotel will receive a special 10% discount, just enquire at Reception or show your room keycard in the restaurant. Advance bookings, Group bookings, and Christmas bookings all taken.